We are happy to announce that we will be celebrating our 34th TORONTO BLOOMSDAY FESTIVAL on Sun. JUNE 16, 2019 in the manner to which you’ve become accustomed. 9am - 12Noon: BLOOM ON THE BEACH. 12Noon - 2.00pm: BLOOMSDAY BRUNCH. Details for all the events will be posted the first week of May, 2019. Looking forward to ReJoycing with you! On Sat. October 13, 2018 @11am, there will be the official UNVEILING of four lane ways, named to commemorate the BLOOM ON THE BEACH Odyssey that has taken place in the Beach every Bloomsday since 1992. They will run eastwards from Peggy Delaney Way from Leuty Ave to Glen Manor Drive. Councillor McMahon will join us for the Unveiling. His Excellency Jim Kelly, the Irish Ambassador to Canada, has been invited as Guest of Honour. These lane ways, especially with the addition of murals planned for a later date, will be a permanent reminder of how on June 16th for the past 26 years, the Beach has been transformed into Dublin for the day. On Oct. 13th while celebrating the UNVEILING, we’ll also acknowledge those who have kept the Toronto Bloomsday Festival flame aglow since 1986: the performers & musicians; our loyal Bloomsday supporters; and, of course, the sponsors and donors who've kept the Floozie in the Jacuzzi afloat with such generous support over the decades. 10.30am: Meet at Peggy Delaney Way Mural – one block south of Queen at Lee Ave.
Hope to see you there in festive attire! The 33th Annual Toronto Bloomsday Festival will be celebrated in the ritualistic manner to which you've become accustomed. Please join us on Sat. JUNE 16th when Toronto will join cities around the world, from Beijing to San Francisco, celebrating this unique Literary Holyday. 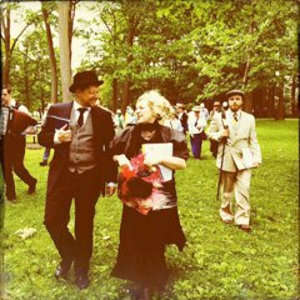 The TORONTO BLOOMSDAY FESTIVAL, produced by Anna Livia Productions has been described by film maker Fritzi Hortstman (director of Joyce to the World), as "glorious...wonderful...with amazing actors....in the top two Bloomsday celebrations anywhere." 9.00am: Assembly at BEACHES LIBRARY, 2161 Queen St. E @ Lee Ave.
Late arrivals please phone the Bloomsday cellphone 416.778.8203 for up-to-the-minute location, or follow the blue & white balloons and the fiddle music. Our Davy Byrne’s with great food, music, readings, a fun Ulysses quiz, singalong & merriment. Join us at Claire’s Bench on the Boardwalk to commemorate some dear friends of Bloomsday who, although no longer with us physically, are always with us in spirit, especially on Bloomsday, a festival they celebrated with gusto. We will sing some songs, including Anna Liffey, in their honour. Dressing up in your Edwardian duds with bonnet or boater is encouraged! for the decades of commitment, hard work and invaluable support he devoted to keeping the Floozie in the Jacuzzi afloat. Go raibh mile maith agat a chara dílis! A hearty go raibh maith agaibh to our cast, sponsors, and especially to our audience for another fabulous BLOOMSDAY 2018! A rollicking version of 'Molly Malone’ kicked off our ‘Kew Gardens Odyssey' on a beautifully mild Saturday. Led by our fabulous band, we transformed Toronto into Dublin 1904 with readings and songs from our extraordinary cast, including new company members Catherine Vaneri and Pip Dwyer. For our Bloomsday Brunch, we christened a new ‘Davy Byrne’s’ – the Gastro Pub, and we thank chef Lorenzo for his special Ulysses-inspired menu. Happy voices could be heard tumbling out into the street as all joined in our Bloomsday singalong, led by maestro Kevin Kennedy and our own Marion Bloom, Catherine Hughes. See you all again in 2019 as the Odyssey continues! Joyce chose this particular date for Bloom's perambulations as a tribute to his wife and muse, Nora Barnacle, whom he first encountered outside Trinity College, close to Finn's Hotel where she worked as a chambermaid. Although initially mistaking him for a Norwegian sailor, she agreed to meet him. June 16th marks their first romantic rendezvous. We’re very pleased to announce that Claire’s Bench has been installed. This memorial bench for our beloved Claire Crawford who was such a crucial part of Bloomsday for so many years is situated right on the Boardwalk along the Beach, just east of Balmy Beach, between Balsam and Beech. Situated under an overhanging tree looking out on a small cove and rocky area, it’s the perfect spot to sit and contemplate. Our installation ceremony in January 2011, which involved, among other rituals, a Blessing of the Bench with Bell’s Whiskey (Claire’s favourite) was a celebration of her wonderful spirit and indomitable life-force. For actress	CLAIRE CRAWFORD GUINN who loved celebrating Bloomsday here on June 16th. From all of us who loved her. ReJoyce! Thanks to all her friends and fans whose generosity made the installation of Claire’s Bench possible. We are proud to be twinned with the Glasthule & Sandycove Bloomsday Festival which takes place in Caveston's of Glasthule and Fitzgerald's of Sandycove, in the shadow of the Martello Tower immortalised in the opening chapter of Ulysses. If you would like to become involved in the BLOOMSDAY FESTIVAL, please get in touch. Volunteers in all departments are most welcome. Anna Livia Productions is a registered charity. We will happily issue a Tax Receipt for all donations received, with our gratitude. We would like to dedicate BLOOMSDAY to the memory of the invaluable members of the Bloomsday cast who have passed away. This year we would like to particularly remember a Bloomsday veteran actor SEAN MULCAHY who graced us with his inimitable style and unique talent since the firstToronto BLOOMSDAY celebration. His inspiration and rendition of The Citizen live on! May their generous souls rest in peace.